St Patricks Day Decorations – visions of green and gold Shamrocks, Leprechauns and the always present Pot o’ Gold … the only way you get your green on. St Patricks Day celebrations have become more popular over the years, and having a get together with friends is a great alternative to doing the Pub Crawl scene. Inviting friends and family to a feast of Corned Beef and Cabbage and some Irish Soda Bread while making some green beer or Bailey’s Irish Creme will be much more memorable than just another night at the bars. Designed specifically for showing off your Irish for a day… or a week or two. These assorted St Patrick’s Day decorations will add a splash of green to your early spring garden, and express your love for the coming of Spring. 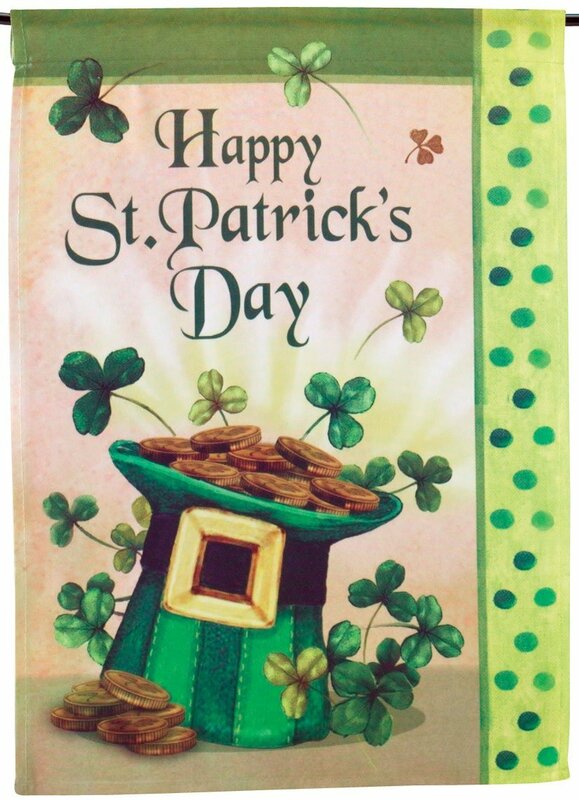 Available in many sizes, here is a sample of our favorite St Patricks Day decorations for your March garden decor. More Great St Patricks Day Decorations – Indoor and Outdoor accents to get your Green on! Everybody’s Irish on St. Patrick’s Day…even this friendly frog! Dressed in his leprechaun best and ready to celebrate, he’ll sit on your porch and greet your guests with a smile. Simply stuff him with plastic shopping bags to make him as plump as you please. Wired hands and legs add stability and let you pose him however you’d like. For use in covered areas. Spot clean. Polyester; imported. Measures 16″L x 9″W x 36″H. Once your guests arrive, you will need to have the proper Green tablewear to serve them in true Irish style. Luckily, there are several designs in disposable party plates and coordinating paper goods to have a great get together without the hassle of clean up. For More Great St. Patrick’s Day Items – From T-Shirts to Music choices, be sure to check out our St. Patricks Day Celebration Gear page!